Last year when I was doing Live Below the Line I went to a cookery demonstration. Boy was that bad timing. four cheese quiche and chocolate, almond and pear crumble. practical and unpretentious, with great advice on what can be prepared ahead. spend more time reliving the 1950s at a country fair. 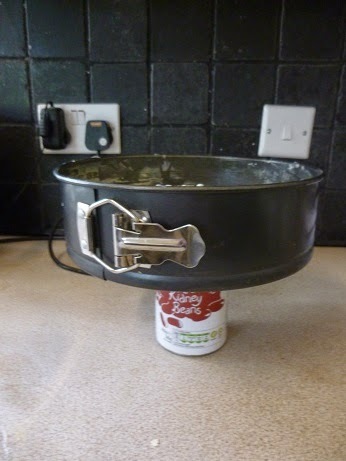 using a bigger 23cm tin rather than the 20cm tin in the recipe. 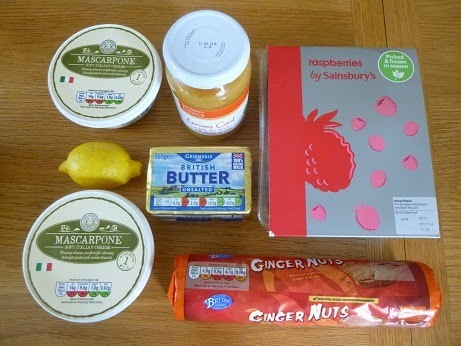 used in the recipe came to £3.75 for a hefty 1.2kg cheesecake. 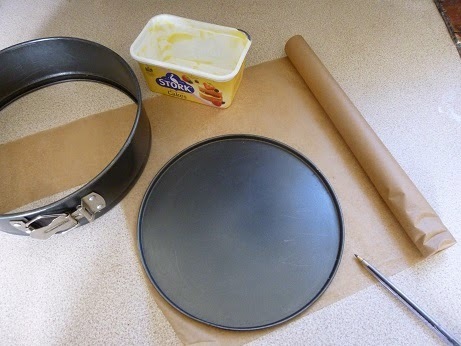 Start by preparing a springform tin (you know, the kind with a metal buckle on the side and a loose bottom). 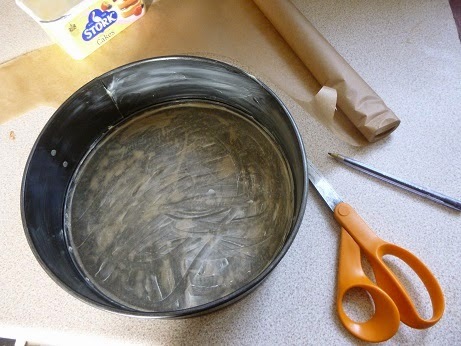 Put the tin on a bit of greaseproof paper and draw round it, so you can cut a circle of greaseproof paper that fits the bottom. I grease the bottom and sides of the tin, then put the greaseproof paper in, then grease that. I’m sure at least part of this is overkill but I really, really didn’t want the finished cheesecake to get stuck. 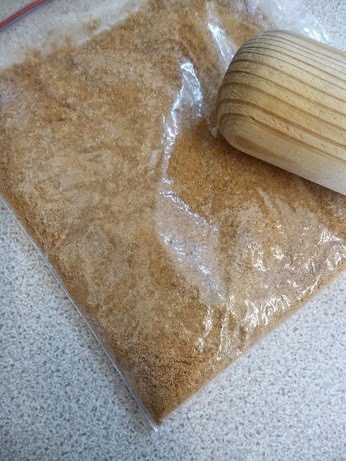 Ginger biscuits in a bag. 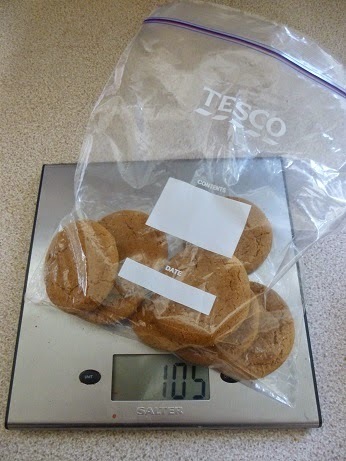 Weigh out your ginger biscuits. I only allowed for part of a packet when costing the recipe, but who am I kidding? With two children and a husband loose in the kitchen, once the packet is open, none of those ginger snaps are going to escape alive. Bung the biscuits into a plastic bag, then bash away with a rolling pin until they are entirely crushed. There may well be a way of doing this with a food processor, but it won’t be anywhere near so much fun. 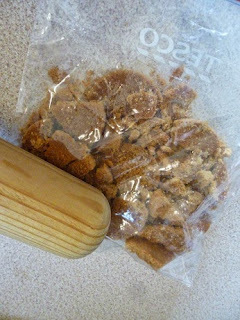 Top tip: use a reasonably thick plastic bag because otherwise the ginger snaps will make a break for freedom all over your worktop. 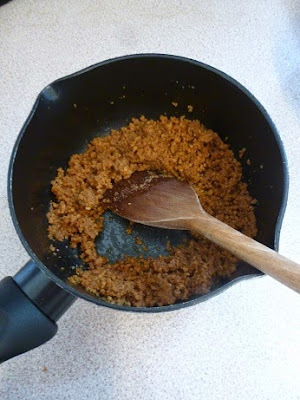 Biscuit crumbs mixed with butter. Best not think about the calories. Melt the butter in a saucepan, add the biscuit crumbs and mix it all together. Then empty the mix into the bottom of your tin and try and make it vaguely level. The lemon never stood a chance. 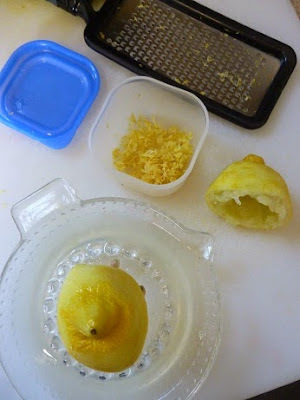 If you’re using the juice from a lemon, I recommend grating the zest (skin) first, so you can use the zest to add lemon flavour to other recipes. 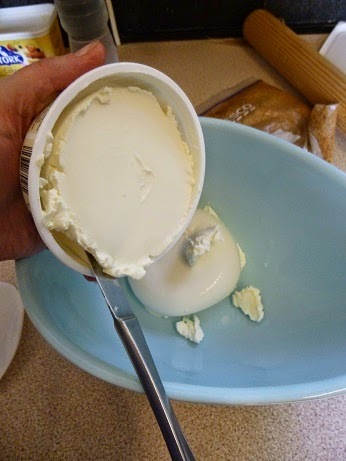 Put both tubs of mascarpone in a bowl. Yes all of it. 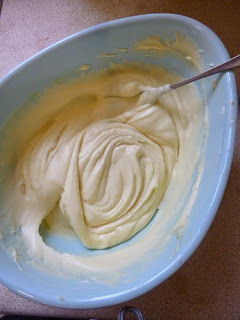 Put the mascarpone, lemon curd and lemon juice into a mixing bowl and stir it round until it is all smooth. Dump the mascarpone mix onto the biscuit base. 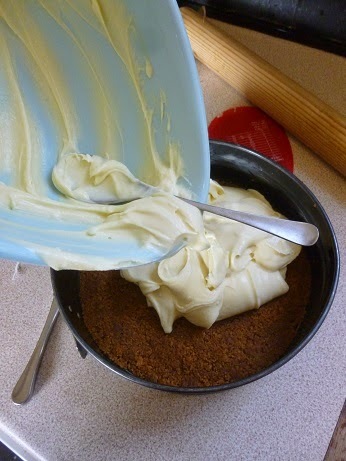 Empty the mascarpone mix onto the biscuit base and spread it out, trying to make it smooth and flat. Then cover the tin with cling film and leave it in the fridge to set. Mary Berry suggests leaving it for between 4 hours and 24 hours to firm up. I left it overnight. 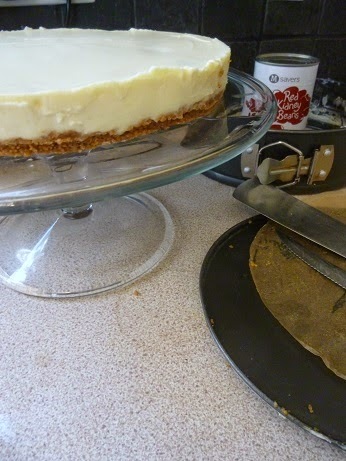 The next morning, I used a knife to slice round the edge, to seprate the cheesecake from the sides of the tin. 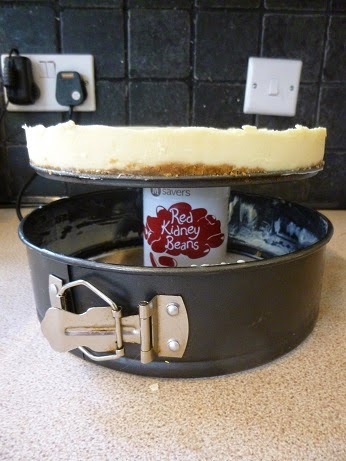 To get the cheesecake out of the tin, start by balancing it on top of any random tin from your cupboard. 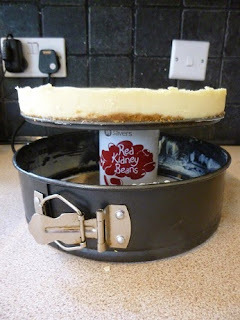 Release the buckle carefully, and then you can drop the sides of the tin down onto the worktop, leaving the metal base and cheesecake behind. 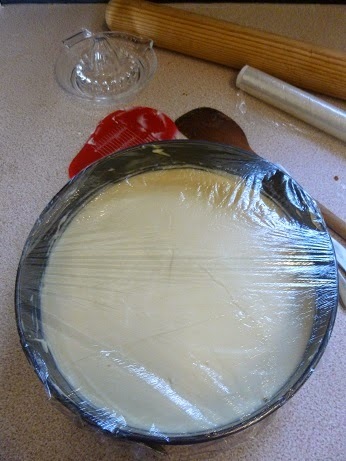 Cheesecake on one side, tin and greaseproof paper on the other. Mary Berry blithely says “remove the cheesecake from the tin, peel off the baking parchment and arrange on a platter”. I think this is the only tricky bit of the recipe, trying to insert a knife between the metal tin and the greaseproof paper so you can lift the cheesecake and paper onto a platter, and then wriggling the knife between the greaseproof paper and the cheesecake base itself, so you can slide out the paper leaving just the cheesecake in all its glory. I left some frozen raspberries on a plate to defrost, and only put them on top of the cheesecake just before serving, so they wouldn’t go all soggy and stain the top. 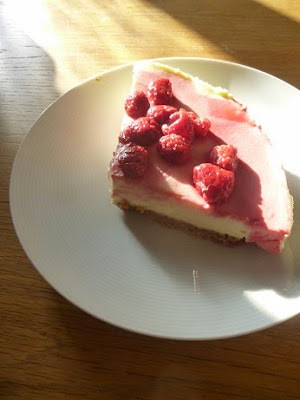 If the raspberries do leak some juice, try tipping the cheesecake one way and the other, so the juice covers the top and it looks slightly more like you did it on purpose. 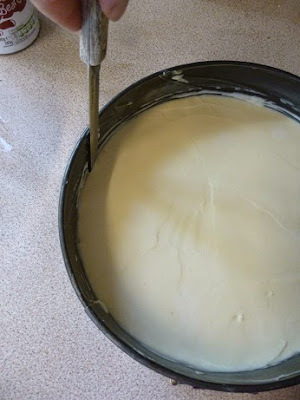 I whisked the cheesecake through for people to eat before I thought about taking a photo of the finished product, but it went down very well with children and grandparents alike. We polished off about three quarters of a cheesecake between six, and the photos shows what was left (but not for long). The Live Below the Line campaign continues until 30 June, if you might consider supporting my efforts to feed myself on £1 a day for 5 days from 26 to 30 April by donating to Unicef, the world’s leading organisation for children.